As I began to drag my hoard of Christmas decorations down from my upstairs storage closets this year, I realized that I was in a bit of a rut. I always buy a few new ornaments every year, and I usually purchase another tabletop tree (don’t tell my husband–I have a bit of tree addiction). Despite these “minor” acquisitions, I realized that when it comes to my Christmas mantel, I have basically put up the same things, more or less the same way, for years. I recently published a post about transitioning a coffee table arrangement from Fall to Christmas in which I suggested that it is not necessary to “reinvent the wheel” when creating seasonal decor. In that post, I showed how I reworked some of the same elements to create a different look season to season. However, I haven’t heeded my own advice to change up anything on my Christmas mantel for a long time. This is what my Christmas mantel looked like last year and for a number of years before that. There are several reasons for this rut. One reason is that I love and have nostalgia for my holiday decor. Another factor is that it is too expensive to refresh everything frequently. But the main reason I haven’t changed up my Christmas mantel decoration in a long time is due to my awesome super-long storage closet. You see, several years ago, I realized that I could install hooks in the closet and just hang up the garland fully decorated. Then each year, all I have to do is take it down, hang it on the mantel, fluff it up a bit, and plug it in. This storage solution was a revelation to me. Before then, I took all the ribbons and ornaments off the garland, wrapped them, and carefully packed them away. Then when Christmas rolled around, it took me hours to wire everything into place again. Given the volume of decorations I put out every year, I really appreciated this time saver. Nevertheless, I thought it was time for a change. 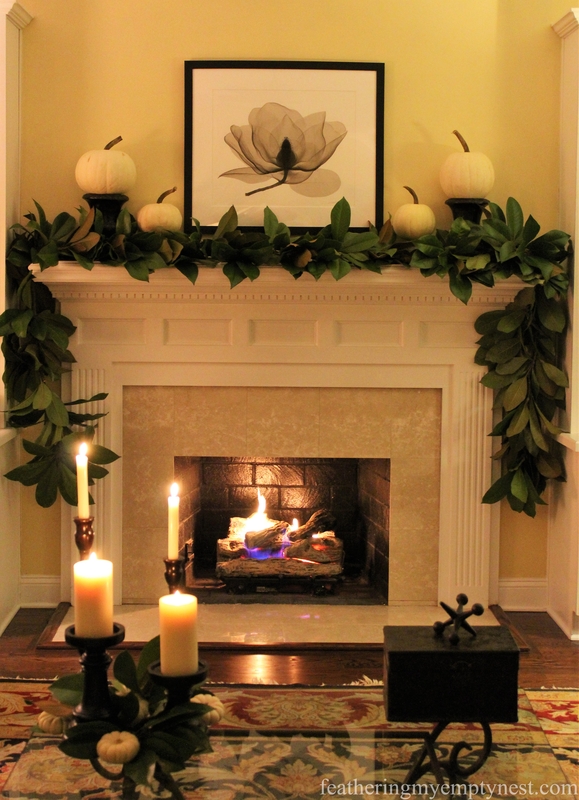 This year I made a fresh magnolia leaf garland which I placed on my mantel along with some white pumpkins for Thanksgiving. I made this garland for Thanksgiving by wiring magnolia leaves from my yard onto a long length of twine. 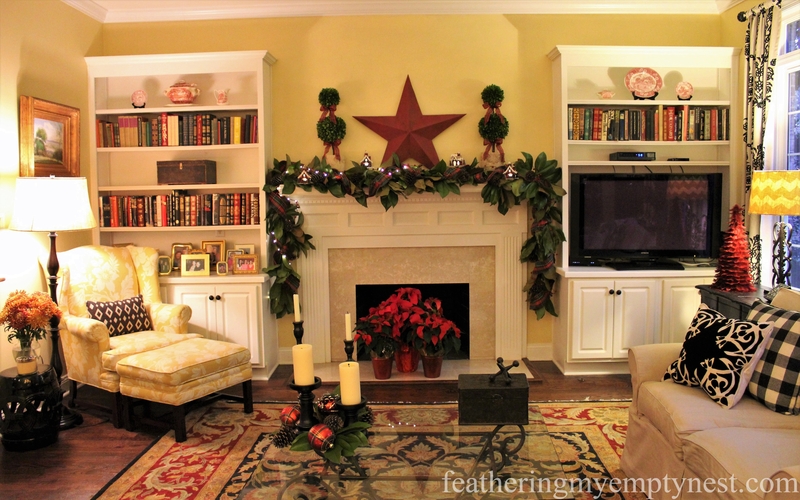 Since it was already in place, I decided to use the magnolia garland as the base for my Christmas mantel decorations. 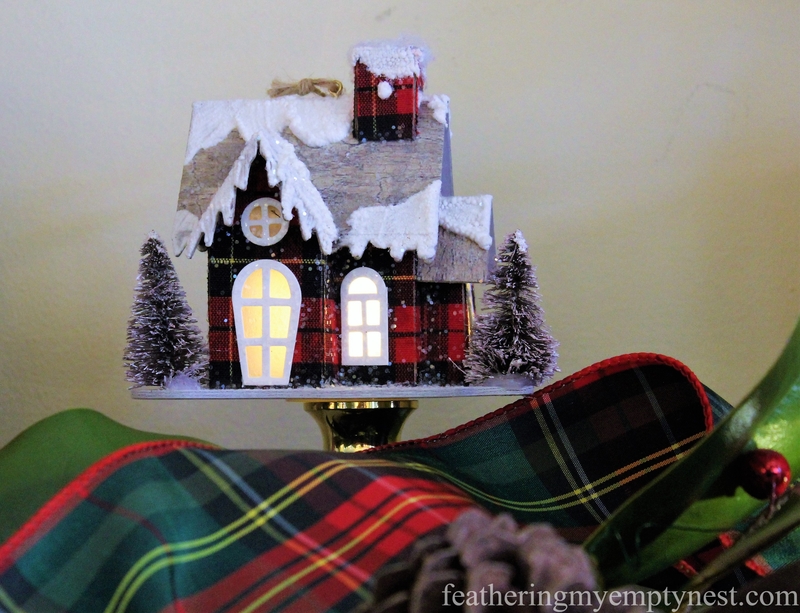 I found these adorable lighted plaid house ornaments at Pier One, and they served as the inspiration for my mantel design. 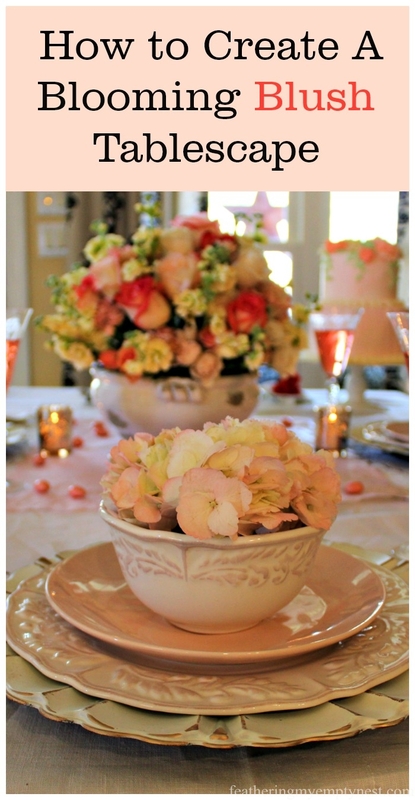 To add height, I placed two of the four houses on top of brass candlesticks. I studded the magnolia leaves with pine cones from my yard and added red berry fairy lights to add sparkle to the garland. I further embellished the greenery with a wide plaid wired ribbon. Above the fireplace. I hung a red tin star that I’ve had for years. And I flanked the star with tall boxwood topiaries which I dressed for Christmas with red plaid ribbons. 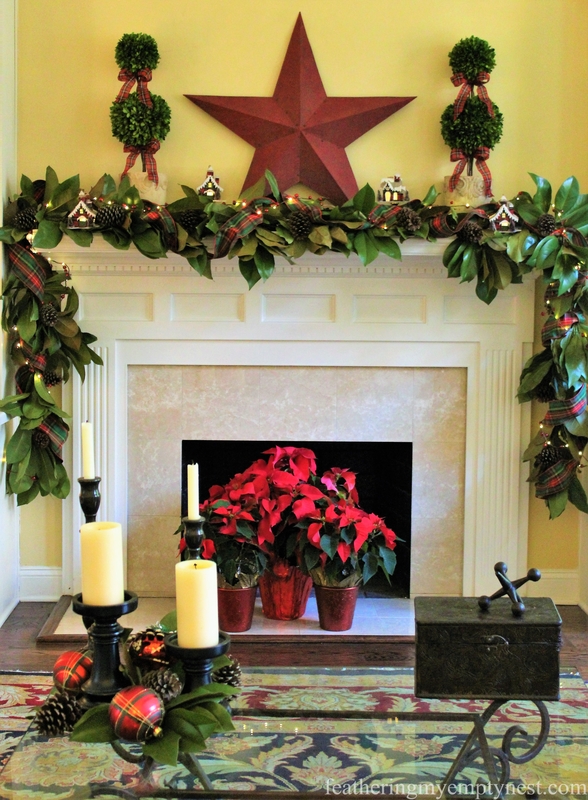 A trio of poinsettias brightens up the fireplace box when there’s no fire. While red Christmas ornaments add more plaid to an arrangement of candles, pine cones, and magnolia leaves on the coffee table. 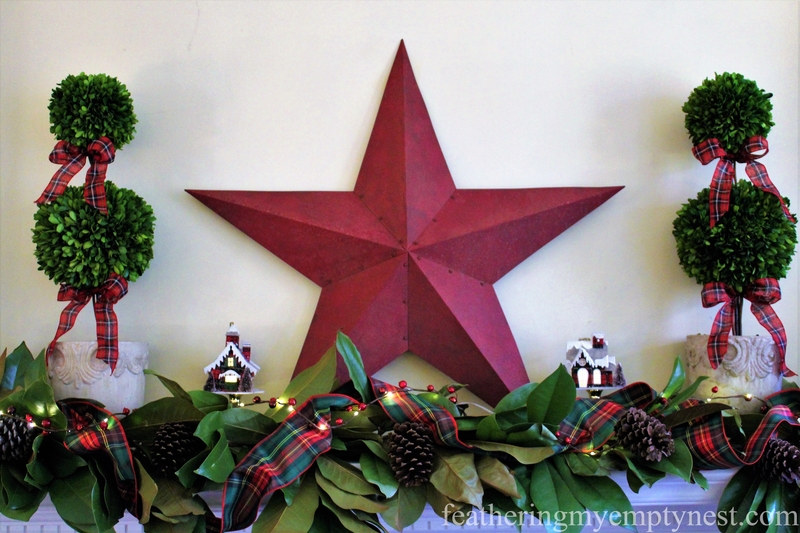 I was able to change up my Christmas mantel decoration this year fairly easily, and because I mostly used natural items from my yard as well as decor pieces I already had, I was also able to create a new look pretty economically. It is fun to try something new, and hopefully, it will give me the kick in the pants I need to try and make more simple changes to my Christmas decor in the future. LOL Lisa, I can almost picture you dancing around singing but they are adorable and that magnolia garland is a beaut. How long does it last? Thanks, Michelle. I am a total goofball but I had fun putting up my little plaid houses. I made the garland before Thanksgiving and it has dried considerably but it is still green. I think it will eventually turn brown but if you made one now, it would stay green through Christmas. And of course, if you use it outside, it will stay fresh much longer. Thanks so much. I really appreciate you taking the time to comment and keeping my shameful tree secret. looks gorgeous.Will have to pass on the Stewart plaid wool balls I have to you. Wish you were in Pgh to help with Glitter & Glow!! Thanks, Cathy for your kind comment. I associate red and green plaids like the Stewart tartan with Christmas. They are so colorful and festive. Very pretty. It is so easy to get into doing the same thing every year. We do it because we know it will work and it doesn’t take too much thought. We have enough to think about, don’t we? Anyway, I like what you did this year. Thanks so much for your kind comment on my mantel. I really appreciate it. Your home is so adorable and cozy! Thanks so much Kari. I really appreciate you taking the time to comment. This is fabulous! Christmas and plaid go hand in hand for me! Those Magnolia leaves and pine cones are so unique! Thanks, Sara for taking the time to comment on my post. 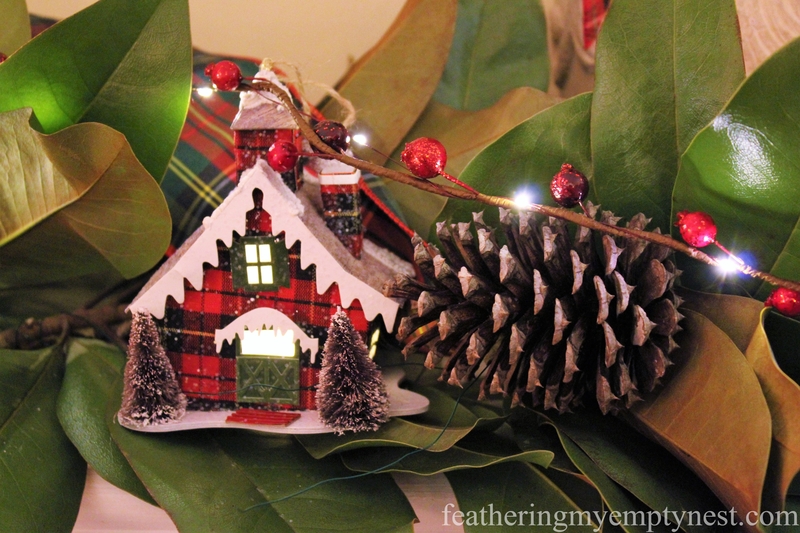 I have several giant Magnolia trees in my yard, so they are a great source for holiday greenery. This looks beautiful! I got a chuckle out of your ‘little plaid houses” too. Sounds like something I would do! Thanks so much for your kind comment, Denise. I am glad to hear I am not the only one who sings goofy songs while decorating! Your mantle looks beautiful! Thanks for sharing with Party in Your PJs! Thanks, so much Lynda. And thanks for hosting. I felt very bored putting up my same Christmas mantle decorations this year, too. 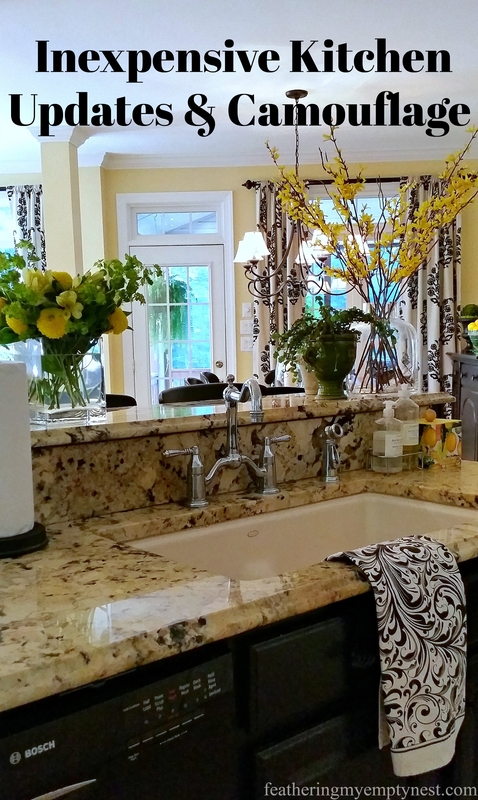 Like you, I try to buy one or two new things or arrange the same things a little differently each year; but a complete overhaul is very appealing. The plaid looks great! You always find the most unique light strings — like your raven cages at Halloween. Love them! Thanks so much, Amy. I am constantly trolling for decorative stuff on sale. My problem is where to store my crazy hoard. I know that you are very creative and talented at design and your Christmas decorating is always beautiful. I often think that if we could collaborate, we’d be awesome! Those Magnolia leaves are stunning! Thanks so much for taking the time to comment. 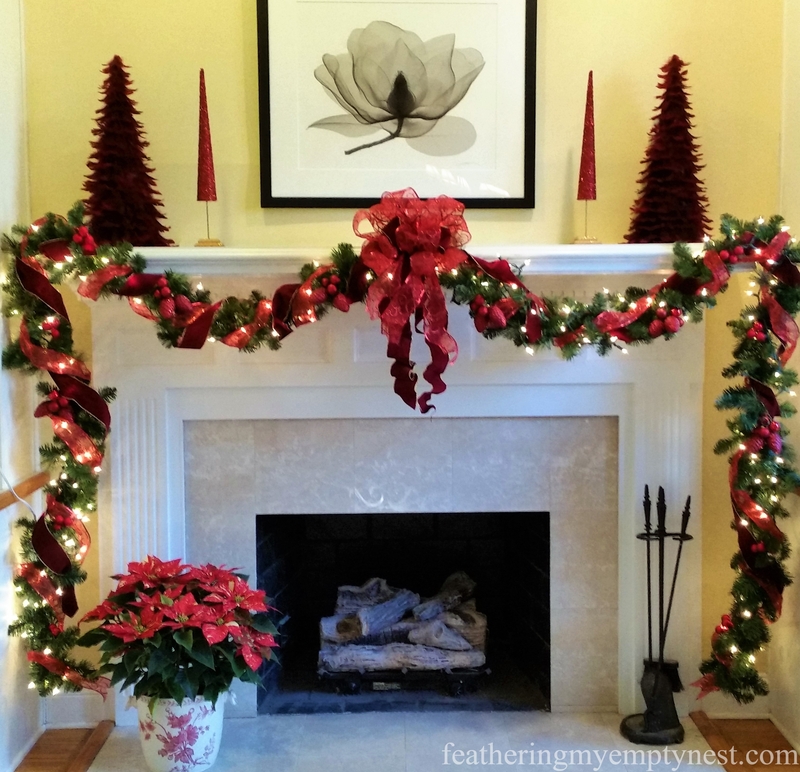 The Magnolia leaf garland was easy to make. You can make it two different ways. The lazy way I made mine by just wiring branches onto your twine, which makes a full and kind of wild looking garland. The other way is to make fanned flat bundles of the leaves and then wire those onto the twine, which makes a tighter more deliberate garland.